Testing for kyu and dan ranks is held at Capital Aikikai twice each year, generally in the Spring and Fall. Dan ranks are awarded through our parent organization, the Capital Aikido Federation. 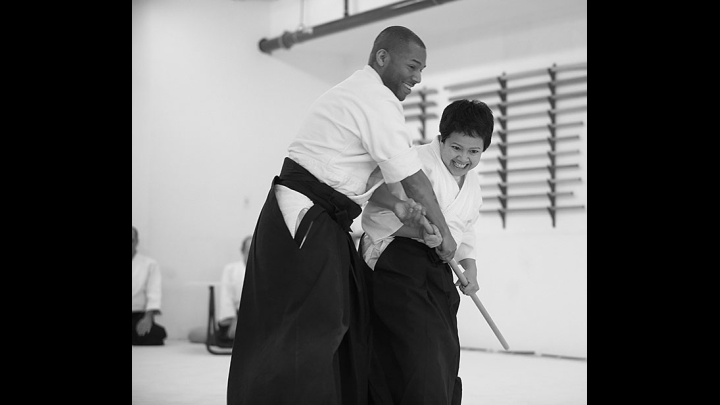 CAF ranks are recognized by Hombu Dojo, Tokyo, and the International Aikido Federation. Those wishing to test at Capital must first ask their sensei for permission. After having received permission, you may obtain a Capital Aikido Federation application for rank from your dojo or this web page. This form must be filled out and turned in (together with the appropriate fees) prior to the date of the test. Please be sure to bring both your completed paperwork and your payment with you on the day of your test. Note: Time requirements are counted from the last test. Please be sure to bring both your completed paperwork and your payment with you on the day of your test. Attend two seminars per year after nidan. Subject of exam to be determined by examiner at the time of the exam. Subject of exam to be determined by examiner at the time of the exam. Kaeshi waza - counter techniques; uke applies the technique to nage. ; initial technique will be called by examiner (e.g., to apply sankyo against nikkyo).